By now you’ve probably heard the news that Cuba/US relations have gotten a lot better thanks to some recent action at the White House. 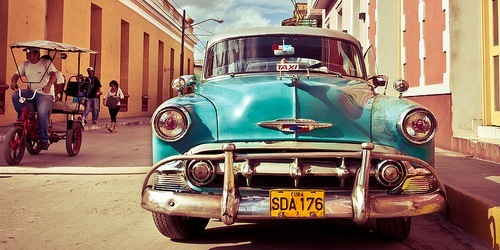 Sure, some thrill seekers may have already visited Cuba since the December announcement, but a lot of logistics need to fall into place before everyday Joes make their way to Havana to check out the 1950s American cars and old-world charm. However, U.S. airline carriers are already working on making direct flights to Cuba a reality, instead of the current workaround where Americans must fly to a Caribbean island and then on to the forbidden land. Not that going to the Caribbean is a terrible problem to have. On January 23rd, MasterCard announced that it would be removing the current block on U.S.-issued credit card transactions in Cuba come March 1st, 2015. So in just over a month, you’ll be able to purchase things with a MasterCard in Cuba, right? Well, perhaps. Just because the block will be lifted doesn’t mean every merchant in Cuba is prepared to handle the change. Additionally, U.S. card issuers need to get on board with the move. In other words, you might not just be able to cruise over to Havana and whip out your Barclaycard Arrival Plus World Elite MasterCard and expect acceptance because it’s a MasterCard. Before you go, it might be wise to call Barclaycard to first let them know that you plan to travel to Cuba, and second that you plan to use their credit card there. Assuming that’s all a go, you’ll still need to hope Cuban merchants are willing to accept credit card as a form of payment. Hopefully that means credit card operations get fast-tracked in Cuba, though a nation that is used to cash might take some convincing. I’ve spoken at length about cash vs. plastic, and I know it’s a polarizing subject. My assumption is that Cubans are all about cash, and probably pretty skeptical about plastic cards used as a form of payment. Really, you expect me to accept that rectangle with numbers on it in lieu of cash? That being said, it might be smart to bring cash when visiting Cuba as well. Just because MasterCard isn’t blocking transactions anymore doesn’t mean it’ll be the preferred form of payment anytime soon. For example, the chance of cabbies having a swipe machine in their old Cadillacs is probably nil. The same goes for small cafes and restaurants, if those even exist. I actually know a story of a guy who traveled to Cuba before this recent diplomatic easing. He foolishly made the trip without any cash, thinking he could use his precious and all-powerful American Express Platinum card for any and all purchases. He got a nasty surprise upon landing in Havana and never even left the airport! That’s right; he freaked out and simply stayed at the airport until he could take the next flight out and back to a Caribbean island where credit cards are widely accepted. So as tempting as it is to visit Cuba before everyone else does (and subsequently spoils it), be sure to do a lot of research and don’t count on credit being a reliable source of payment. Update: Stonegate Bank out of Pompano, Florida has released a debit card that is designed to work in Cuba. Cardholders can use the card at hotels and restaurants, but it won’t work in ATM machines in Cuba. At the moment, you’ll need to sign for all debit MasterCard purchases using the card, but the hope is to expand its use to ATMs next year.